David Evans, UN-Habitat, opened the session. Explaining that, ‘our actions should build on the resilience of people,’ he warned that excluding those affected by disasters during rebuilding will cause unintended harm. In his keynote address, Robert Glasser, UN International Strategy for Disaster Reduction, noted that lack of knowledge and financial capacity leads to disaster vulnerability – gaps that can be filled through implementing the Sendai Framework on Disaster Risk Reduction. Moderator Sri Husnaini Sofjan, Huairou Commission, invited panellists from Haiti, Iran, Mexico, Mozambique, Nepal and the Philippines to share their experiences of how they responded to disasters in their country. Panellists highlighted the importance of conducting training schemes for masons and engineers, and enabling affected populations to actively participate in rebuilding their communities following a disaster. Many underscored the importance of disaster preparedness. Hans Guttman, Asian Disaster Preparedness Centre, moderated a second panel in the session. Panellists from the European Commission, the International Federation of Red Cross and Red Crescent Societies, the UN Development Programme, and the World Bank called for increased engagement with those affected by disasters and recognition of their agency, emphasising the need for accountability, coordination and across all sectors and levels. Several added that time-sensitive preparedness plans are crucial, and the European Commission questioned how to ‘build back’ not just from natural disasters but from man-made disasters caused by civil war. For once, please put your professional career on hold for just six days and take it to the 9th World Urban Forum (WUF9). In just 17 years nothing is going to look the same again. The unprecedented threats from our changing climate being discussed are: Multi- droughts, floods, heat-waves, superstorms, forest fires, land degradation or tree diseases (beetles or fungi) and acid rains will have hit everyone everywhere. Mass-migration, warfare, airborne viruses, pathogen diseases and epidemies just to mention a few of the forth coming horrors… To slow down these non-avoidable man-made (non-climate related) hazard scenarios emergency and evacuation, we need to plan urban resilience right now. Local government leaders must prioritise climate change action (CCA) to mitigate and prepare for urban disaster risk reduction (DRR). The World Urban Forum is the one existing multi-scalar context to plan and prepare for global development in our changing climate, please take learning from its extensive and comprehensive programme and discussions between 7th to 13th February – http://wuf9.org. It offers a unique opportunity to share good practices from the cities resilience profiling programmes on the development and mainstreaming of DRR plans and multi-stakeholder’s engagement in the operationalization of resilience building strategies. 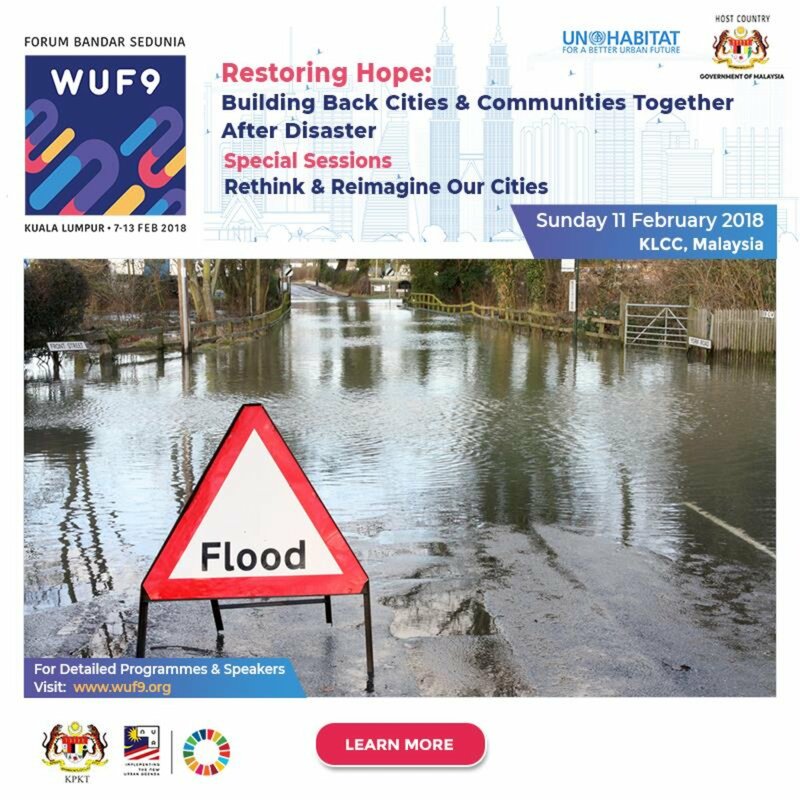 WUF9 will provide insightful examples for cities not only on the planning and implementing of the risk-sensitive plans but also on engaging multi-sectoral dialogue in resilience building processes. This is a final call upon local governments leaders to develop integrated local Disaster Risk Reduction (DRR) and Resilience plans to guide their actions. Professionals, promote local-level-authorities power and capacity for resilience in developing and implementing DRR policies and actions in local legislation. It takes time to invest and deliver urban shock tolerance. This call is as in effect an early warning system as a way of raising awareness and mobilising public interest more than that public demand for changes to reduce disaster risk. Six days of your life, you can do this. If worst come to worst, we must NOW plan for underground living. Urban Underground Space with the aim to increase mobility, liveability and resilience of urban area. Places urban underground space within the context of climate change, city resilience and rapid urbanisation.